Quito, 6 November 2014 – Intensive unsustainable hunting and illegal killing of migratory birds are taking place in many parts of the world driving species to the brink of extinction. Some of the affected migratory birds are globally threatened such as the Spoon-billed Sandpiper and Yellow-breasted Bunting, which are protected under the UNEP Convention on Migratory Species (CMS). At the 11th Conference of the Parties to the Convention (CMS COP11), currently taking place in Quito, Ecuador, countries are due to take steps to combat illegal killing, trapping and trade in birds. The resolution on the prevention of illegal killing, taking and trade of migratory birds being proposed for adoption at CMS COP11, calls on Parties to the Convention to work together to address this threat. It underlines that countries need to ensure that adequate national legislation is in place and enforced in compliance with existing bird protection laws. A key measure proposed by the resolution is the creation of an intergovernmental task force to address illegal killing, taking and trade of migratory birds to tackle the problem. This Task Force will support governments and other stakeholders to stop the illegal killing, taking and trade of migratory birds, including through exchange of best practice, promoting monitoring of trends in these illegal activities and encouraging the development of specific action plans at regional and international level. 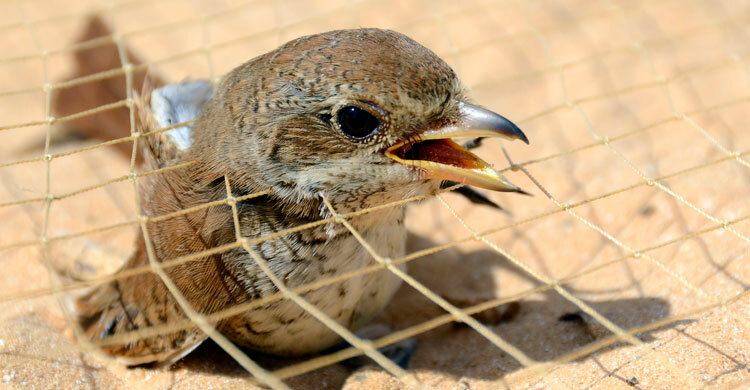 CMS and its African-Eurasian Migratory Waterbird Agreement (AEWA) have already assisted Egypt and Libya to develop an action plan to put an end to the practice by local hunters of trapping migrant songbirds. While this has been a longstanding tradition, it has increased in intensity to the extent that there is now a 700-km line of nylon nets set up along the Mediterranean coastline of North Africa which is probably contributing to the population decline of some species. BirdLife International is currently leading a quantitative assessment of the scale of illegal killing of birds in the Mediterranean. Preliminary results from under half of the 27 countries assessed already suggest that tens of millions of individual birds may be illegally killed each year. Huge numbers of birds are killed during their spring migration in Malta every year, including raptors, waterbirds, landbirds and many other species that are protected by international law. Elsewhere in the world, numbers of the Semipalmated Sandpiper, a long-distance migrant wintering in Guyana, Suriname and French Guiana, plummeted by almost 80 per cent over the last 30 years, in part due to widespread hunting. The birds are killed with a method called “chocking wire” which consists of a metal wire attached to a post perpendicular to flight lines and as flock pass, the wire is whipped up and down, passing through the flocks and killing or injuring birds. In order to help stop the dramatic decline, the species has been proposed for strict protection at CMS COP11. Illegal hunting is also the key threat that has driven the Siberian Crane to the brink of extinction along its central flyway connecting the Russian Federation and India. With only 20 Siberian Cranes remaining in Western Siberia, it is one of the most threatened species in the world. Under the umbrella of the CMS Memorandum of Understanding concerning Conservation Measures for the Siberian Crane, education programmes have been developed involving hunters and local authorities in a widespread conservation initiative in Afghanistan, Kazakhstan, Russia and Uzbekistan along the Siberian Crane’s flyway. As a result, hunters started to participate in monitoring and to report sightings. Conflicts with farmers over crop damage and crane hunting have reduced and conservation of their wetland habitat has increased. Despite these encouraging results, hunting remains the primary cause for the decline of this critically endangered species. Until recently, up to 140,000 Amur falcons were killed in Nagaland, India, as a cheap source of protein. Thanks to an educational campaign initiated by the Indian government with support of the CMS Memorandum of Understanding on the Conservation of Migratory Birds of Prey in Africa and Eurasia, no birds were killed for the first time in 2013. The adoption of this resolution will be a milestone that complements other collaborative efforts such as the International Consortium on Combating Wildlife Crime and in particular relevant actions taken under the Convention on International Trade in Endangered Species of Wild Fauna and Flora (CITES). CMS COP11 also presents the opportunity for an unprecedented step forward in global flyway conservation with the adoption of a Programme of Work for Migratory Birds and Flyways. It is also expected to adopt action plans or guide intergovernmental working groups or task forces to tackle bird poisoning, reduce negative effects of renewable energy developments and the adoption of a conservation strategy for African-Eurasian landbirds. At the Conference, Governments will also consider including the heaviest flying bird, the Great Bustard in Appendix I of the Convention and are expected to agree on a Global Action Plan for the Saker Falcon which aims to combat illegal trade and help restore populations of this iconic species. The Convention on the Conservation of Migratory Species of Wild Animals (CMS), also known as the Bonn Convention after the German city in which it was signed, works for the conservation of a wide array of avian, aquatic and terrestrial species through negotiation and implementation of agreements and species action plans. With currently 120 member countries, CMS is a growing convention with special expertise in the field of migratory birds. Several instruments have been concluded under CMS to conserve migratory birds. The CMS Memorandum of Understanding on the Conservation of Migratory Birds of Prey in Africa and Eurasia (Raptors MOU) aims to promote internationally coordinated actions to achieve and maintain the favourable conservation status of migratory birds of prey and to reverse their decline. Developed under the framework of CMS, the Agreement on the Conservation of African-Eurasian Migratory Waterbirds (AEWA) is an intergovernmental treaty dedicated to the conservation of migratory waterbirds and their habitats across Africa, Europe, the Middle East, Central Asia, Greenland and the Canadian Archipelago. The Bern Convention is a binding international legal instrument in the field of nature conservation, which covers most of the natural heritage of the European continent and extends to some States of Africa. Its aims are to conserve wild flora and fauna and their natural habitats and to promote European co-operation in that field. Also related to illegal killing of birds, COP has adopted today an ambitious Action Plan for Migratory Landbirds in the Africa-Eurasian Region (AEMLAP), aimed at improving the conservation status of this group of birds through the international coordination of action and catalysing action at national level. The Action Plan provides an overarching, strategic framework for action at the international level to conserve, restore and sustainably manage populations of migratory landbird species and their habitats. Directive 2009/147/EC of the European Parliament and of the Council of 30 November 2009 on the conservation of wild birds ensures far-reaching protection for all of Europe's wild birds, identifying 194 species and sub-species among them as particularly threatened and in need of special conservation measures.